Developing the evangelical church across Macedonia, to share the Gospel with as many people as possible in the country. The Evangelical Church in Macedonia has established the first network of evangelical churches and continues to plant and grow churches in the country. From a parent church in the capital city of Skopje, a network of 32 churches and humanitarian projects extend throughout Macedonia. Macedonia is one of the poorest countries in Europe, both financially and spiritually. The historic Orthodox culture and growing Islam influence from Albania is becoming an increasing challenge for the church. Our partner ministry, the Evangelical Church in Macedonia, are crossing ancient cultural boundaries, fighting perceptions and tackling discrimination, to plant local churches across the whole country. Outreach events are a key part of the church’s annual programme, and each church offers mid-week meetings as well as Sunday services, where individuals have an opportunity to study and grow in their understanding of the Bible. The ministry has also set up Macedonia’s first evangelical Bible school, where local Christians can be trained from their home congregations. 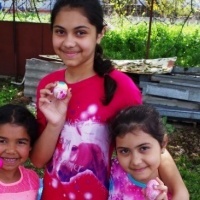 This ministry has grown among the Romani population in Skopje, a community suffering from poverty, oppression and lack of education as well as deep-rooted traditions in Islam and folk superstitions. A specific church has been set up for this community in this area, as well as the standard Evangelical church. The ministry runs a humanitarian aid programme called AGAPE. Through AGAPE, in the last few years they have served many refugees crossing the borders into the country, providing food and clothing. They also served many of the people affected in the deadly floods in the capital city in summer 2016. Macedonia is one of the poorest countries in Europe and has a population of 2 million. Against the backdrop of political tensions and instability, Macedonia has struggled to emerge economically and unemployment is above 30%. Orthodox culture is strong and the western side of the country has a high percentage of Muslims which is continuing to grow. In Macedonia, this Easter our partner ministry put on “The Big Smile”, a fun activity day for local children.